Nelson's Newsletter is published twice a year and is sent to current members of Lord Nelson's mailing list. If you would like to be added to our mailing list, please email us, or use the email submission form above. Upon receipt of your request for the newsletter, you'll be placed on the list for upcoming newsletters. Thank you. 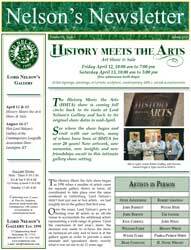 Click on the newsletter image for current Spring 2019 newsletter. You'll need Adobe Acrobat Reader to view the Newsletter. You may download the free reader at this link should you need it.